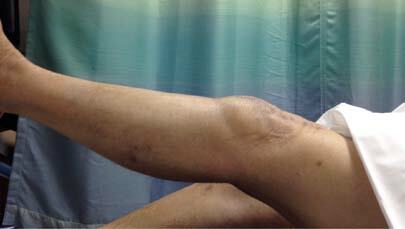 Background: Extensor mechanism failure secondary to knee replacement could be due to tibial tubercle avulsion, Patellar tendon rupture, patellar fracture or quadriceps tendon rupture. An incidence of Patella tendon rupture of 0.17% and Quadriceps tendon rupture of around 0.1% has been reported after Total knee arthroplasty. These are considered a devastating complication that substantially affects the clinical results and are challenging situations to treat with surgery being the mainstay of the treatment. 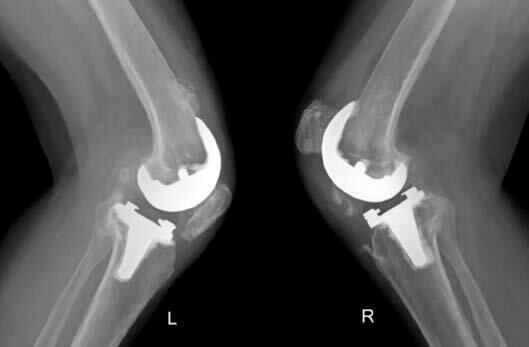 Case Description: We report here an interesting case of a patellar tendon rupture of one knee and Quadriceps tendon rupture of the contralateral knee following simultaneous bilateral knee replacement in a case of inflammatory arthritis patient. End to end repair for Quadriceps tear and augmentation with Autologous Hamstring tendon graft was done for Patella tendon rupture. The Extensor mechanism comprises of the quadriceps musculature, patella, patellar tendon and its attachment at the tibial tubercle. The disruption of the extensor mechanism can be a devastating complication post knee replacement surgery and its incidence has been reported to be between 0.17 to 2.5 % [1,2]. The cause of these ruptures can be multifactorial and can be primarily classified as patient related or the surgery related. An important part of management of these conditions is identifying the cause and if possible rectifying it along with the surgical repair or reconstruction. A 76 year old female presented in our OPD with Bilateral severe Osteoarthritis Knee. She had history of proximal femoral nailing done 3 years ago at some center for Intertrochanteric fracture in right hip, which failed eventually leading to pseudoarthrosis and a limb length discrepancy of 2.5cms with right lower limb being shorter than the left. The patient however was asymptomatic in right hip (Fig.1). Her pre-operative investigations were within normal limits except for low vitamin D3 level (10ng/ml) which was corrected with supplementation. Systemic disorders like Rheumatoid arthritis were ruled out pre-operatively. She underwent Simultaneous Bilateral total knee replacement by standard Medial parapatellar approach using Nexgen® LPS-Flex (Zimmer, Warsaw, USA). 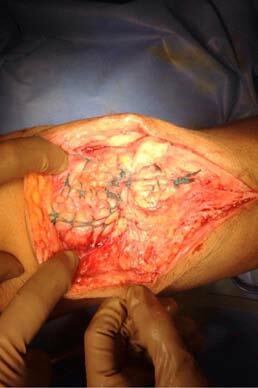 Patelloplasty was performed bilaterally and no lateral retinacular release was done. Good patellar tracking was seen using the no touch technique. Besides osteoporosis, mild fragility of the tissues was noted intra-operatively which were carefully dealt with. The patient had a fall on hyperflexed knee on post-operative day 2, following which there was a superior pole patella fracture (Fig.2), for which modified tension band wiring with two k wires was done (Fig.3). 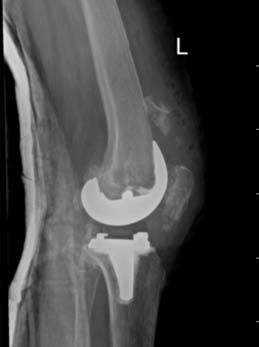 Adequate reduction of the fracture was obtained intra-operatively followed by a meticulous closure of the retinaculum and protection with above knee long extension brace postoperatively. After 6 weeks of index surgery, patient again had a twisting injury following which she presented with pain and instability following which she was completely bedridden. The examination of Left knee revealed anterior knee joint pain and swelling, positive straight leg raising test, an extension lag of 200 with further flexion upto 1000, palpable defect just above the superior pole of patella with the tips of the k wires being palpated subcutaneously. To our surprise, there was also Right knee anterior joint line tenderness with a positive straight leg raising test, extension lag of 200 with a further flexion of 1000 and a palpable defect below the patella. Bilateral knee joint x rays revealed a re-fracture with displacement of the k wires superiorly in the left knee joint (Fig.4) and patella alta in right knee (Fig.5). A diagnosis of bilateral knee extensor mechanism disruption was thus made and a decision to perform bilateral reconstruction at the same setting was taken. Procedure: Under spinal anaesthesia in supine position, both the lower limbs were scrubbed and draped together. In supine position, under tourniquet coverage, previous midline incision was used. After removal of the protruding K wires from the upper pole of patella, a complete tear of the quadriceps muscle associated with associated retinacular tear was identified (Fig.6). The femoral and tibial components and the poly insert were assessed carefully and found stable. An end to end Krackow type repair between the freshened quadriceps and the patella was executed with the help of polyester sutures (Ethibond Excel®, Johnson and Johnson, USA), which were passed through three vertical troughs in patella (Fig.7). Retinaculum was repaired and the reconstruction was assessed thoroughly. Knee was immobilized post-operatively with a cylindrical cast. In supine position, under tourniquet coverage, previous midline incision was used. 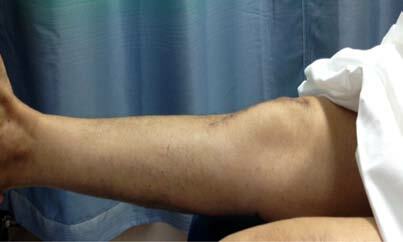 Complete patellar tendon tear was identified at the level of inferior pole of patella. The semitendinosus tendon was isolated from the pes anserinus keeping the tendon insertion intact. An oblique tunnel was drilled just below the level of tibial tuberosity from infero-medial to supero-lateral direction. 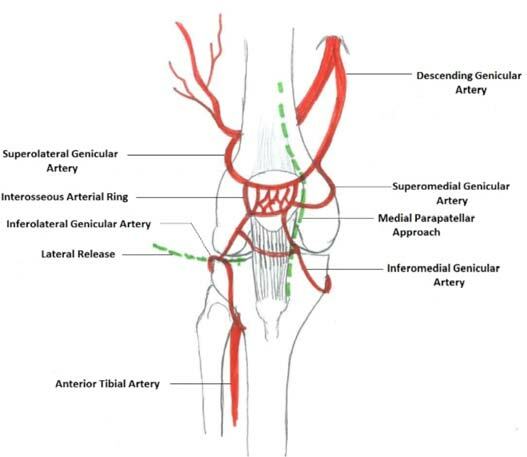 The prepared semitendinosus graft was first passed from the tibial tunnel followed by two vertical troughs, made in patella (Fig.8) and then finally sutured back at the level of pes anserinus insertion, holding the patella downwards (Fig.9). Retinaculum repair was done meticulously. The wound was closed over layers followed by immobilization with a cylindrical cast. Mobilization was started on post-operative day 2 with the help of walker with full weight bearing as per pain tolerance. 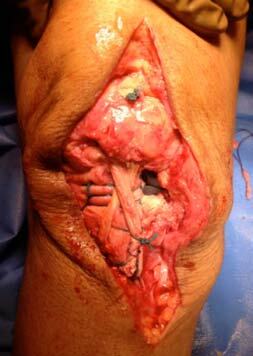 Suture removal was performed after two weeks of surgery and the surgical wound was found healthy in both the knees. Knee examination was performed after cast removal, 6 weeks after surgery which revealed No extension lag with an active flexion of around 300 in both the knees. Gradual active and assisted knee flexion was started as per the pain tolerance. Informed consent from the patient and her relatives was taken for reporting this case. 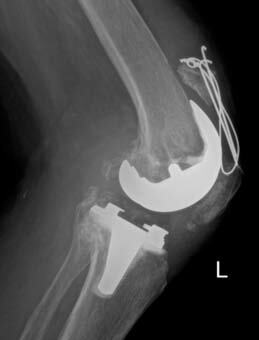 Extensor mechanism injury after total knee arthroplasty, can be a disastrous complication, which can be dealt adequately by proper pre-operative planning and assessment. It is especially important to address the modifiable risk factors or any component malposition, before undertaking a reconstruction in patients with extensor mechanism disruption following total knee replacement. The Vascular supply of the extensor mechanism comes from intraosseous and extraosseous arterial ring (Fig.14). The extraossueous arterial ring is further divided in superior and inferior portions. The popliteal artery gives off four branches posteriorly, namely superior medial and lateral and inferior medial and lateral genicular arteries arising above and just below the knee joint line respectively. The supreme or the descending genicular artery arises from the femoral artery anteriorly just below the later enters the adductor hiatus. 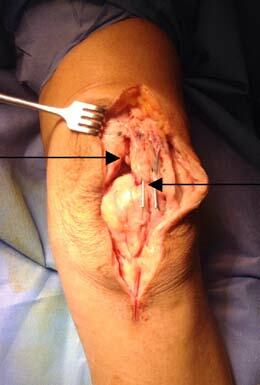 A Recurrent branch of the anterior tibial artery arises at the level of fibular neck just below the knee joint line. The intraosseous arterial ring further consists of mid patellar and infrapatellar osseous branches. Standard Medial parapatellar approach being surgeon friendly, is one of the most commonly used approach for the knee arthroplasty with an advantage of wide exposure. However, as this approach involves splitting the quadriceps tendon proximally and medial retinaculum distally, it potentially compromises the medial blood supply of knee joint almost completely. It tends to disrupt the superior and inferior medial genicular and the superior genicular vessels. Furthermore, removal of the lateral meniscus and infrapatellar fat pad may lead to a compromise in the blood supply to patella by disrupting the lateral inferior genicular and the recurrent branch of anterior tibial artery. The risk factors for the Extensor mechanism rupture have been summarized in Table 1. The management of Extensor mechanism ruptures can be quite challenging and all aspects must be considered before embarking on surgical intervention. Of these, correcting the modifiable factors pre operatively is of utmost importance. The prognosis depends upon various factors - the duration since the tear occurred - Acute or chronic, the level of tear- Quadriceps tendon or retinaculum, patella fracture or patella tendon tear (intersubstance or tibial tuberosity avulsion), type of tear- Partial or complete and on the factors such as co-morbid conditions, condition of the tissues and bone and overall requirement and needs of the patient. Conservative treatment can be a good option in surgically unfit patients, patients refusing surgery, patients with patella fracture without loosening of the component and extensor lag of less than 200 in patients with partial tears . The surgical intervention includes direct end to end repair using non absorbable sutures like polyethylene terephthalate like ethibond, staples , stainless steel circlage wires or suture anchors . Augmentation can be beneficial in cases where the tendons and bones are fragile. Autologous augmentation grafts includes semitendinosus alone, semitendinosus along with gracilis graft [12,13], opposite side Bone patellar tendon bone graft , Turndown of the quadriceps tendon , ipsilateral medial gastrocnemius flaps .The use of hamstring grafts like semitendinosus has been shown to have a stronger repair as compared to the free grafts for the reconstruction of extensor mechanism [12,16], The autologous grafts have an advantage of good tissue holding strength, is cost effective and is not associated with foreign body reaction like in case of allogenic grafts. 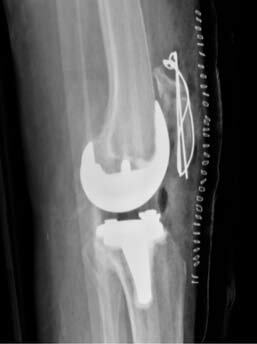 The allogenic graft augmentation on the other hand is required in cases where more mechanical strength is required for the fixation to hold with poor quality of tissues as in cases of revision Knee arthroplasties. Allogenic graft options includes use of Achilles tendon graft , grafts comprising of quadriceps tendon, patella, patella tendon and tibial tubercle . 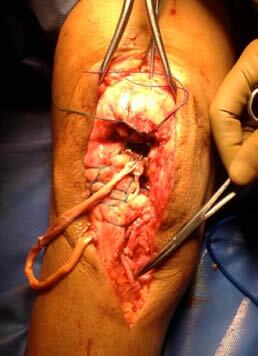 We used medial parapatellar approach with preservation of fat pad while performing bilateral knee replacements. 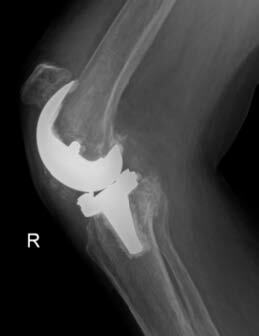 No lateral release was done and also the patella was not replaced since the thickness of both the patella was <10mm. Investigating into the cause for these extensor disruptions, we identified few preoperative risk factors related to our case which were – history of inflammatory arthritis, low vitamin D3 levels (10ng/ml), a probable history of taking oral steroids (ayurvedic medicines) and a definitive history of intraarticular injections possibly steroids. Of the biomechanical cause: lack of a stable hip and frequent instability may have been a contributory factor. The component alignment was satisfactory on both sides with no overhangs or signs of component malrotation. While the Left side disruption occurred following a clear history of trauma, right side was a subtle injury highlighting the role of pre-existing factors predisposing to the same. This case is unique as to best of our knowledge only two studies have been published in literature mentioning about bilateral involvement of the extensor mechanism after total knee arthroplasty. One study mentions about bilateral simultaneous extensor mechanism rupture after simultaneous total knee replacement in a rheumatoid patient with chronic use of steroids . The other study with bilateral extensor mechanism disruption was in two morbidly obese patients with previous total knee replacement done, among which one patient has a recurrent patellar tendon rupture . We used end to end repair with krackow type sutures and patellar drill holes for quadriceps tendon rupture on one side and repair of patella tendon with augmentation by ipsilateral semitendinosus graft and both procedures gave a reasonably functional results at 1 year follow up. The augmentation was necessary to protect and add strength to the patellar tendon repair as the results of the end to end repair alone are very poor. Some studies have used a tension band wiring system as a protective measure for augmenting and protecting the repair but in our case we thought of using the natural hamstring tendon as the augmenting tissue. On the other side we were able to reattach the bulk of quadriceps tendon by making a trough into the superior pole of patella and protecting it with casting. Over the time the healing was reasonable good despite the concerns about the poor nature of the native tendon. The key to the procedure on this side was creating a healthy bone trough with bleeding bone that brings about the healing factors and optimizes the healing mechanism. Optimal protection of the repair is equally important to prevent failures. In conclusion, we believe that this case report is unique for being a case of bilateral extensor mechanism disruption where in the disruptions occurred at different anatomical locations. It is important to screen the patients preoperatively, for any co-existing morbidities and risk factors and whenever possible optimize them before surgery. Augmented repairs for patellar tendon ruptures and primary repair of quadriceps tendon after creating a good boney trough on patella is a helpful technique for such disruptions.